Thrive 100% Kind and Gentle Dog treats are perfect pocket-sized treats that have been specially formulated for dogs with sensitive stomachs or when training your puppy. Made out of 100% low fat chicken pieces, these tasty and healthy treats contain only 100% single proteins, vitamins and minerals, and a powerful flavour that will keep your dog coming back for more. 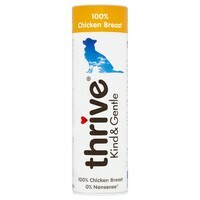 Thrive Kind and Gentle Treats do not contain any animal derivatives, chemicals or mystery ingredients.